Rest easy at our newly-renovated lodgings in Spokane, Washington, ideally located on North Division Street in Spokane and just 15 minutes from downtown. 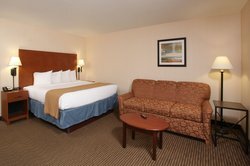 Whether you’re visiting nearby businesses or in town for a local tournament, our spacious accommodations are the perfect place to stay. 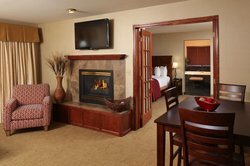 Our cozy hotel rooms in Spokane, WA come with convenient in-room amenities, such as complimentary Wi-Fi, Keurig coffee makers, microwaves, and mini-refrigerators. Thanks to our excellent reviews from past guests, our hotel is ranked #6 out of 1500 Quality Inns in the country. Included in your stay with us is a complimentary breakfast each morning and an evening reception every Tuesday and Wednesday. Quality Inn Oakwood is happy to offer a host of amenities and services to make each stay truly feel like home. 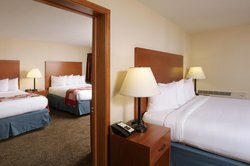 Discover the complete guest experience while lodging in Spokane, Washington at our exceptional hotel. Perfect for the corporate traveler or outdoorsy pair, our King Room provides busy travelers a place to rest right on Spokane’s largest street. Complete with thoughtful amenities such as complimentary Wi-Fi, a Keurig coffee maker, a microwave, and a mini-refrigerator, our clean and cozy accommodations have everything you need. 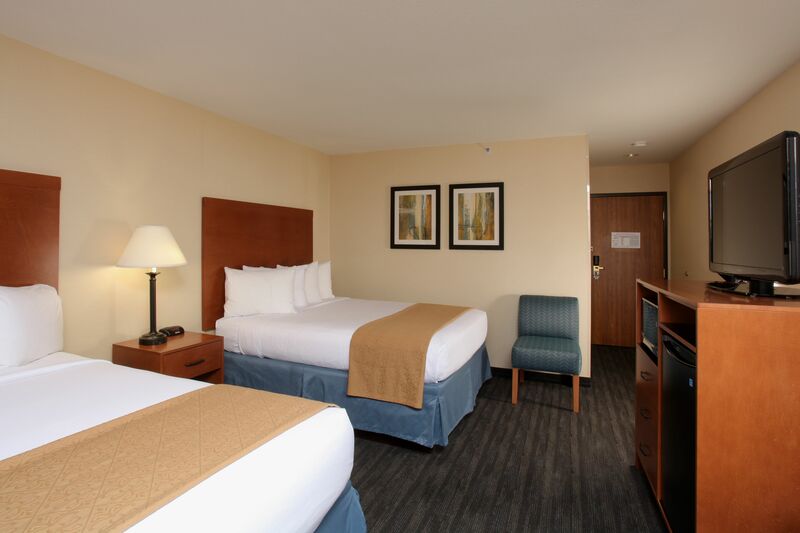 Whether you’re visiting nearby businesses or a local tournament, our spacious accommodations are the perfect place to stay. 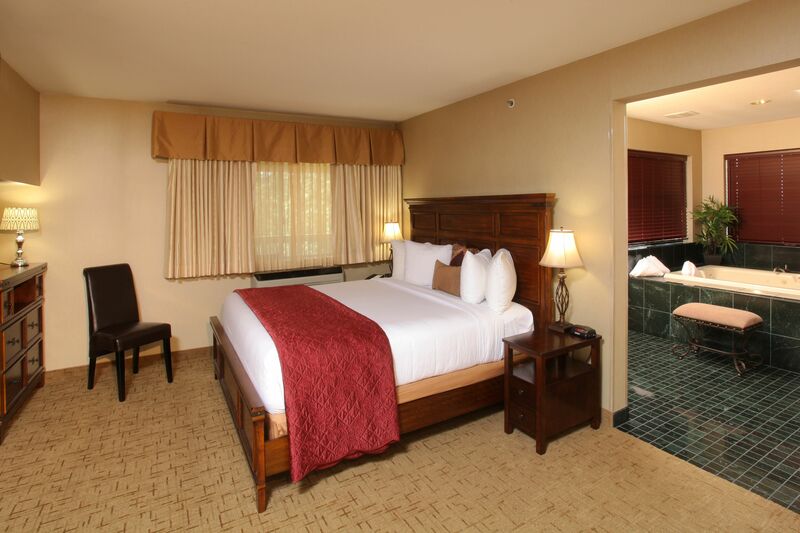 Find the comfort you’re looking for in our Accessible King Room. 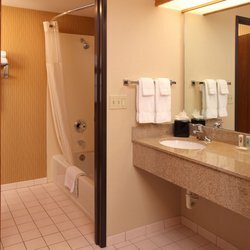 The bathrooms have lowered countertops and grab bars installed in easy-to-reach places. Each of our lodgings in Spokane, WA include complimentary Wi-Fi, a Keurig coffee maker, a microwave, and a mini-refrigerator. 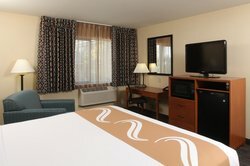 Our accessible rooms offer complete comfort and hearing accessories for travelers visiting Spokane. Each of our accessible hotel rooms are outfitted with visual doorbells and alarms. 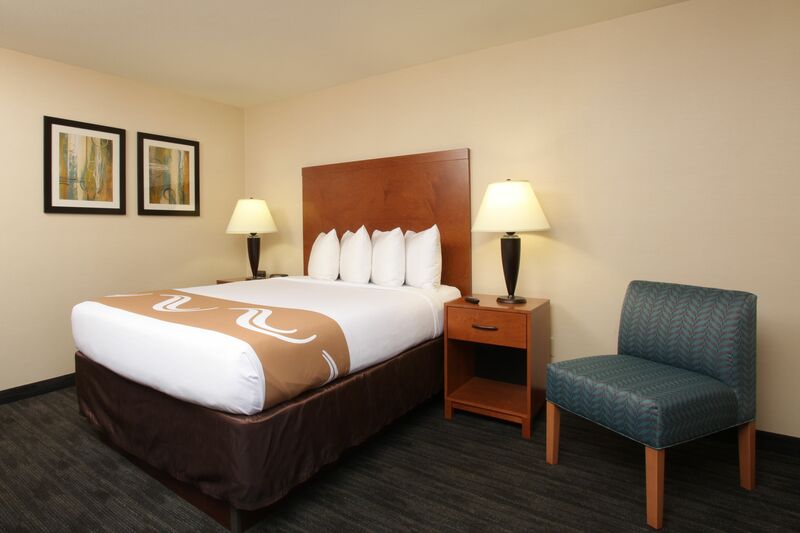 Enjoy a quality night’s sleep in a queen bed with crisp bedding and soft pillows. Relax in our spacious guest room with accessible features that include visual alarm alerts, visual telephone alerts, and visual doorbell alerts. Each of our accessible rooms features thoughtful amenities such as complimentary Wi-Fi, a Keurig coffee maker, a microwave, and a mini-refrigerator. Stretch out and sleep with the space you’re looking for in 2 comfortable queen beds. We’re dedicated to providing the perfect ‘home away from home’ experience. Stretch out and sleep with the space you’re looking for with 2 comfortable queen beds. 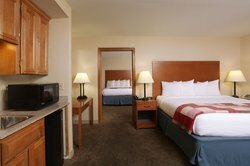 We’re dedicated to providing the perfect ‘home away from home’ experience with our Spokane accommodations that feature complimentary Wi-Fi, a Keurig coffee maker, an HDTV with HBO, a microwave, and mini-refrigerator. Enjoy a little extra space in our 1 King Executive Room, with a pull-out sofa bed for additional guests. It’s easy to prepare snacks and drinks in your room, with the convenience of a Keurig coffee maker, microwave, and mini-refrigerator. Stay connected with the office with complimentary Wi-Fi or kick back with an evening show on the HDTV with HBO! Enjoy a little extra space in our 1 King Executive Room, with a pull-out sofa bed for additional guests. Double your comfort with a stay in our 2 Queens Executive Room, boasting additional space and a walk-in shower. Traveling with your team has never been easier, thanks to convenient in-room amenities like complimentary Wi-Fi, a microwave, mini-refrigerator, and HDTV with HBO. 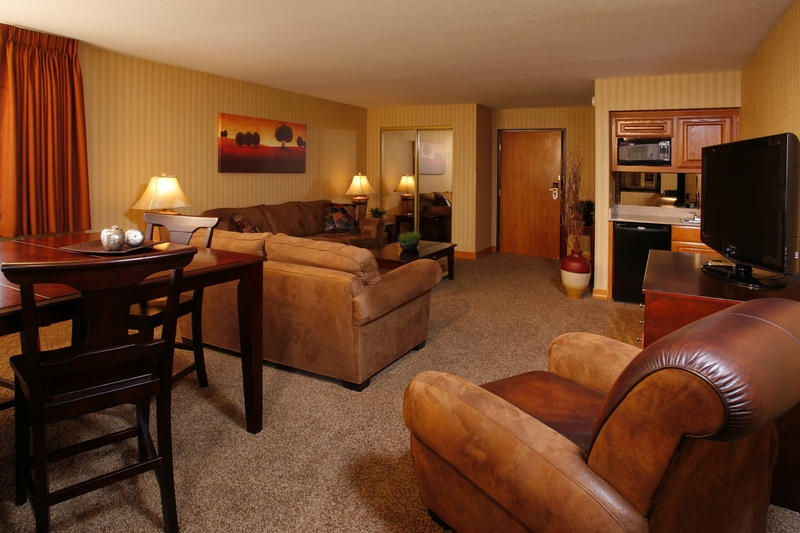 Also known as our Rosewood Suite, elevate your stay with one of our suites featuring a loveseat recliner. Sleep soundly in a king bed made with crisp sheets and soft pillows. For the couple who wants to getaway, or the business traveler who enjoys some extra space, treat yourself to the Rosewood Suite. Also known as our Rosewood Suite, elevate your stay with one of our suites featuring a loveseat recliner. Also known as our Oakwood Suite, treat someone special to a night away in our luxurious suite! Soak in your very own jetted Jacuzzi tub just steps away from the deluxe king-sized bed. This two-room suite features a large living room with a flat-screen TV and dining area with a table for four. The bedroom boasts another flat-screen TV, spacious bathroom, and sitting area. Enjoy your next getaway to the Lilac City! Soak in your very own jetted Jacuzzi tub just steps away from the deluxe king-sized bed. This two room suite features a large living room with a flat-screen TV and dining area with a table for four. 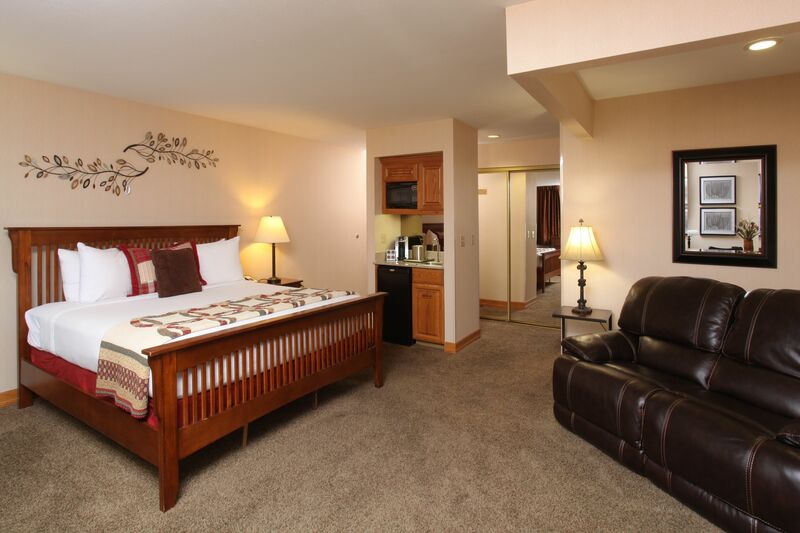 The bedroom boasts another flat screen TV, spacious bathroom and sitting area. Enjoy your next getaway to the Lilac City! Our Evergreen and Amber Suites offer a special added touch of luxury. A two-room suite with a fireplace that sees through the division, this suite boasts a full living room with a sofabed, dining table, and wet bar. Rinse the day away with dual showerheads or soak in the jetted Jacuzzi tub. In addition to an incredibly comfortable king bed, these suites offer balconies for you to enjoy the fresh outdoor air. Indulge in our most luxurious suites during your stay with us! Indulge in one of our two-room suites with a fireplace that sees through the division, a full living room with a sofabed, dining table, and wet bar. Rinse the day away with dual showerheads or soak in the jetted Jacuzzi tub. Our Evergreen and Amber Suites offer a special added touch of luxury with a see-through fireplace and Jacuzzi tub. In addition to an incredibly comfortable king bed, these suites offer balconies for you to enjoy the fresh outdoor air. 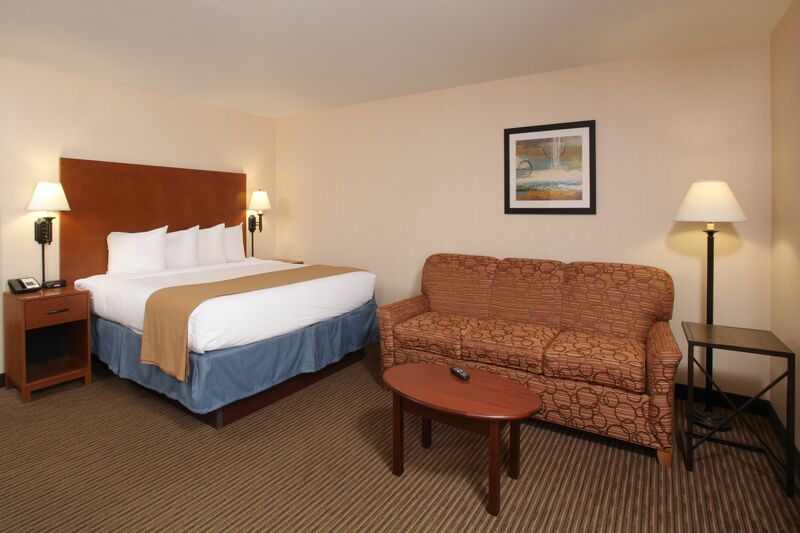 There’s space for everyone in our Family Suite, with 1 king bed and 2 queen beds in adjoining rooms. This 2-bedroom suite has 2 TVs, 2 bathrooms, and plenty of space for everyone to comfortably share. Easily prepare snacks with the microwave and mini-refrigerator, and stay connected with complimentary Wi-Fi. Keep everyone together in our spacious lodgings in Spokane, Washington! 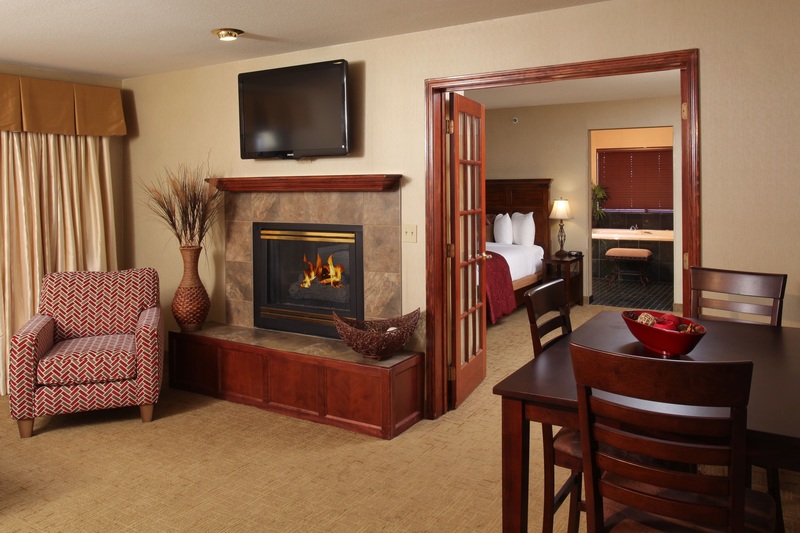 This 2-bedroom suite sleeps 6 guests and has 2 TVs, 2 bathrooms, and plenty of space for everyone to comfortably share.